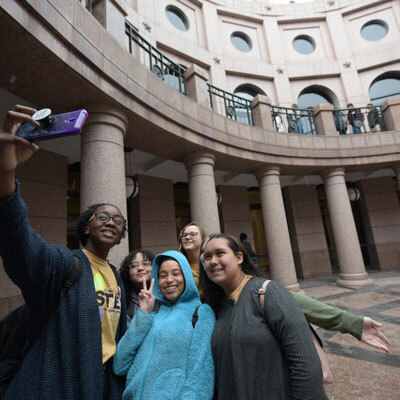 AUSTIN - Three teams of Smith Middle School seventh- and eighth-graders qualified for a statewide conference about tackling challenging community issues and one brought home the first-place trophy. Seventh-graders Oshaun Brown, V.J. Brown and Reanna Anthony won among middle school teams with a project examining the need for better streetlights and sidewalks in the neighborhood around their school. The other Smith teams examined gender equality in their school and drug use awareness among peers. All three teams, composed of 11 students, won the praise of their teachers for their hard work outside of school to prepare for the Friday event at the State Capitol. 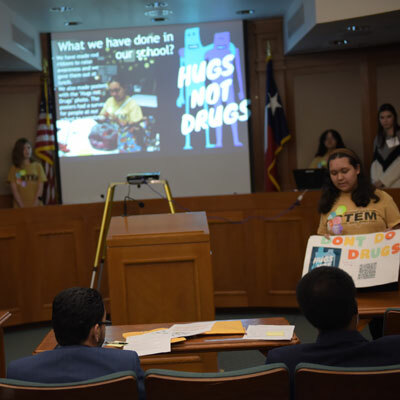 Eighth-grade teams included “Hugs Not Drugs,” Ivan Sandoval, Joanelis Rios, Meredith Buechi and Nicole Martinez-Cumba; and “Gender Equality,” Audrey Frisch, Nykaela Burks, Ariana Motton and Jeannie Sebexen. 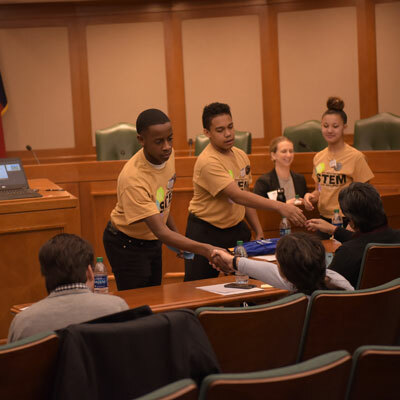 After earning a shot to go to Austin at a school competition, the three teams labored to improve their projects, working on the weekends to shore up the oral presentations, which they delivered in front of judges. Seventh-grade teacher Katie Drake said the hard work showed, with student presentations showing their newfound confidence and broadened knowledge. The students researched local media reports and talked with Killeen ISD Superintendent John Craft and a former Killeen city councilman as well as school staff members, parents and students in gathering facts and gauging opinion about streetlights on Bunny Trail. Answering judges’ questions, students said the school superintendent agreed with students’ concerns and explained the issue includes the city, the utility company and property owners. Each team presented information and then persuasive argument to various panels of judges, then answered judges’ questions. “I thought it was a great experience,” said eighth-grader Nicole Martinez, who worked with the team that presented “Hugs Not Drugs,” which calls on increased awareness events at her school regarding the dangers of drug use. “It’s important because we know people who do drugs and we know it’s important because it affects your health and how you do in school,” she said. During the closing ceremony before announcing results, State Senator Kirk Watson praised the middle school and high school students from throughout the state for showing they care about their schools and community. The Austin-area state senator told students, teachers and parents that those who feel the sense of urgency to make a positive difference don’t need to seek public office, but just need a caring heart, a bit of moxie and willingness to touch other people’s lives.